Five million visitors every year, Unesco World Heritage Site, 1.2 million acres, never-ending views, you hear others describing it and no matter how prepared you think you are, you’re in for a once in a lifetime experience. Theodore Roosevelt, who made the Grand Canyon a National Monument in 1908 said once “The Grand Canyon fills me with awe. It is beyond comparison—beyond description; absolutely unparalleled throughout the wide world.”. The other night I was watching “The Guilt Trip” a silly comedy in which Barbra Streisand drives with her son (Seth Rogen) to the Grand Canyon. After looking at it for 5 seconds they both decides that they had enough, but they will tell everyone that they looked at it for at least 10 minutes, because the place deserves at least 10 minutes. I could have spent a year, walking around, looking, thinking, not talking. We arrived at sunset, we were tired, thought about stopping at the hotel and visiting only the following morning. We wisely chose to keep on driving all the way to the entrance and to get in, even though it looked like we were not going to have much light left. We were wrong. From the first vista point the spectacle unfolding was amazing. Whatever you do, try to see the Grand Canyon at sunset. The site became National Park in 1919. It’s roughly divided in two areas, the North and South Rim. The North Rim is harder to reach and stays closed from Winter to Spring. The South Rim is easier to reach and gets far more traffic. The vista points are (like in every other National Parks I’ve visited in the USA) well designed and easy to access. We basically drove from the Grand Canyon Village, were we stayed at the Grand Hotel.The hotel was ok, basic and clean, nothing luxurious, but functional. I read great reviews about the El Trovar Lodge, but it was sold out for weeks before and after our trip dates (mid April). The restaurants situation was a bit lacking for our spoiled New Yorker palates, but a trip to the convenience store provided a decent clean meal enjoyed in the privacy of our bedroom. We got up early the following morning and drove back into the park and followed the E Rim Drive (AZ State Route 64) all the way to the exit of the park on the eastern side. 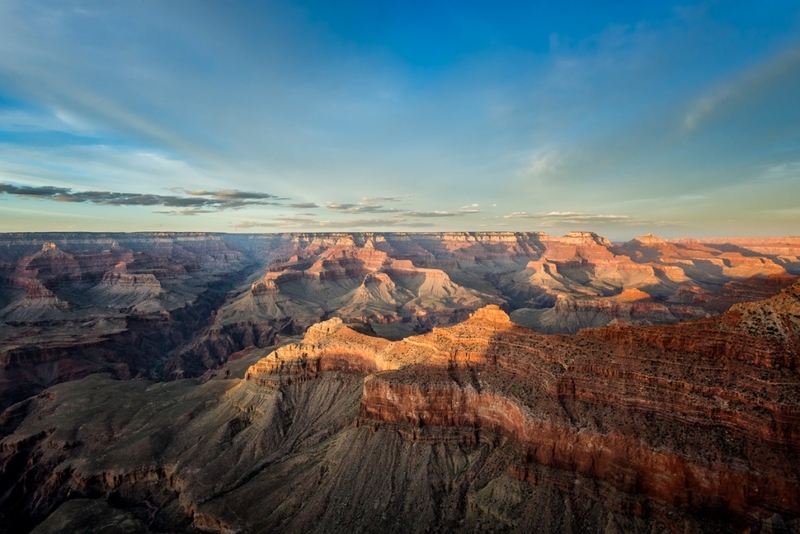 The recent studies have established the Grand Canyon to be around 17 million years old. Although there’s a new controversial study published in 2012 that suggests the site could be as old as 70 million years. The deepest areas of the canyon, reach about 6,000 feet. The canyon is part of the Colorado River basin and it’s great depth can be attributed to the uplifting of the Colorado Plateau. The whole park is managed by Grand Canyon National Park, the Hualapai Tribal Nation, and the Havasupai Tribe.